Willis Brothers – Basic Beach and Surfing Safety Guide plus Etiquette !!! Be it your first time to the beach or going on 50 years of Ocean Devotion this valuable Beach and Surfing Safety Guide offers tips and safety information even long time “Salts” can benefit from. Easy to read, understand and apply, take time to look it over, pass the info on and help save lives !!! Remember beach safety is no accident – – – Know before you go !!! For the first time anywhere the world’s first and foremost complete ———— Basic Beach and Surfing Safety Guide plus Etiquette !!! 1. Sunscreen. Use hand lotion sunscreens as opposed to spray on sunscreens. If you do use aerosol and spray bottle sunscreen be aware it can blow down wind through the air right into your neighbor’s eyes and lungs. 2. Keep your music low. While you may love to blast your music remember many people come to the beach to hear the waves, seagulls, peace and quiet. 3. Sand Holes. If you dig a deep hole in the sand, fill it before you leave. 4. Don’t leave trash. Pack it in pack it out. a. Look for possible hazards i.e. rip currents, rocks, jetties, piers, lobster traps etc. b. Look at over all conditions such as tides, swell height, wind direction, where waves are breaking and where they are not. c. Decide where you are going to swim or surf. Long shore currents can drag swimmers up or down the beach. Generally the larger the waves the stronger the current. To avoid getting swept up or down the beach by the long shore current have a stationary reference point. (House, rock formation, tree, etc). For swimmers this can also help you keep track of your towel and belongings at the beach on a crowded day. Rip currents occur along side or in between waves. Where rip currents occur the water is deeper. Where waves occur water is shallower. Rip currents do not always flow straight out and can be difficult to identify. Flash rip currents appear at unpredictable times. Bigger waves create stronger rip currents. To identify a rip current look for the spaces or gaps in between the waves or along side waves. a. To avoid rip currents simply wade or swim in front of the waves. b. To escape rip currents stay relaxed, swim or tread water toward the waves. Waves are the oceans escalator of energy heading toward the shore. The closer a swimmer gets to the waves the weaker the pull of the rip current will be and the easier it will be to swim in. Watch our Rip Current Safety Video Here. a. Bees: Be vigilant for bees washed up along the shoreline some alive some not, however both can still sting. b. Jellyfish: If stung by a jellyfish use vinegar to negate the sting. Do not rinse in fresh water or rub stinging area. c. Stingray: There are 3 common ways of hopefully avoid stepping on and getting stung by a stingray. 1. Stingray shuffle. Shuffle your feet when walking out into the ocean to avoid steeping on a stingray. 2. Stingray tap. Stomp after every few shuffles loudly to alert the stingray you are coming and for the stingray to move away. 3. When ever possible look. In shallow or clear water it is possible to see stingrays resting on the ocean floor. Stingrays have a razor sharp harpoon barb on the end of their tails. When stepped on they inflict a sharp jab (usually in the foot) as if having stepped on a nail. If stung by a stingray it is extremely painful. The most common remedy used by surfers and lifeguards is to immerse the afflicted wound in hot water for one hour. 6. Swimming in shallow water can be dangerous. Never dive straight down head first into the ocean or while body surfing. If you do dive off or fall headfirst keep your arms in front of you or tuck and roll. 7. While in the ocean never have anything in between you and the waves. 1. A surfer has the right of way over a surfer paddling out. 2. The surfer closet to the curl or breaking part of the wave has priority possession. 3. Riding together can be ok, dropping in on or interrupting a surfer’s ride is not. 1. Never have anything between you and the wave. Your surfboard should be underneath you or to your side and pointed into the waves. 2. Never dive or fall head first off the surfboard. If you do, put your arms out to protect your fall or tuck and roll. 3. Always know how to take off your leash without looking before ever going out into the ocean. 4. Remember generally waves are much bigger than they appear from shore. 5. A B C’s of Surfing – Always Be Cool ! Surfing like life there will be great rides and there will be wipeouts. These ups and downs are part of the entire experience and are best handled by practicing remaining cool and calm under pressure…. Outside Magazine’s Rip Current article !!! It seems everyone is talking about surviving rip currents. Dr. Jamie Machanan weighs in as does Capt. Chris Brewster for the USLA and NOAA and others including yours truly in the comment (not to be confused with the comic section) online. While the main topic is escaping rip currents strangely nothing is said about avoiding rip currents in the first place. 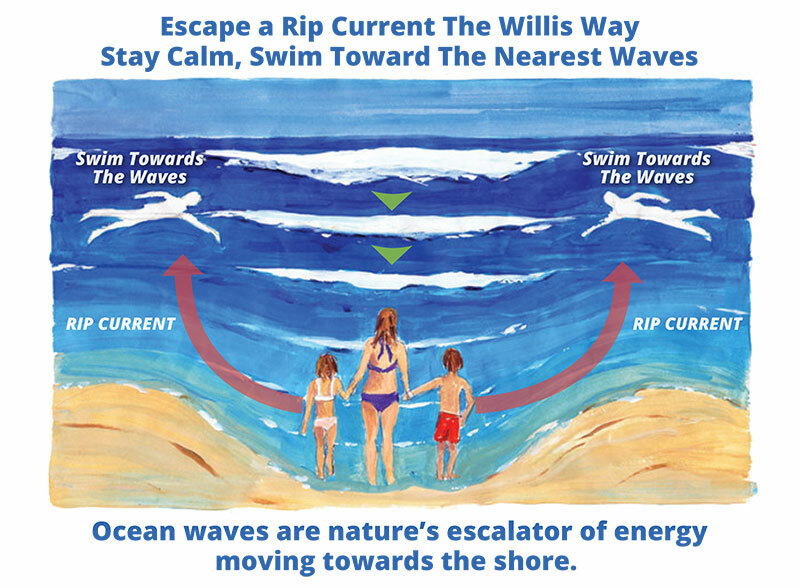 Anyone who has been following the Willis Way knows the Willis brothers have been advocating how to avoid rip currents for decades. In the comment section Capt. Brewster maintains the USLA and NOAA do offer advice on avoiding rip currents but strangely doesn’t say what that advice is! Also why isn’t this supposed advice posted on every guarded beach? Outside Magazine’s article and the comments after are very well worth taking the time to read. Take your time and please weigh in! Here’s a link that will take you just like a rip current to the Outside!!! Anyone out there with any friends and family will also want to share so others can help spread accurate information and save lives— possible your own!!! OK friends tune in next Thursday for YES the Girls Of Summer which promises to be HOT!!! The Red Cross and United States Lifeguard Association U.S.L.A. have earned big respect for the long time and continued Marine Ocean Safety performed in San Diego California, through out America and world wide. This is an open letter to you and the public in hopes of precipitating outdated and over due lifesaving changes in current Rip Current policies adopted by the Red Cross and United States Lifeguard Association U.S.L.A. over fifty years ago. Current (and outdated) Rip Current policies promoted by the Red Cross and United States Lifeguard Association U.S.L.A. and taught by Jr. Lifeguard programs through out the nation are obsolete, incomplete and potentially dangerous. Scientific studies by Oceanographer Dr. J. MacMahan have proven swimming side ways to escape rip currents is more dangerous than simply floating on one’s back. Rather than advocating “blindly” swimming parallel to the beach to escape rip currents we the Willis brothers Milton B. Willis and Michael C. Willis advocate the Willis Way — swim to the nearest waves to escape rip currents. In addition current Red Cross Rip Current and United States Lifeguard Association policies do not address how to effectively avoid Rip Currents. 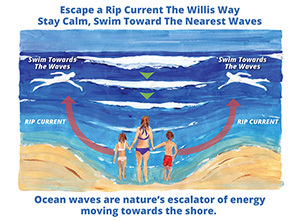 The Willis way to avoid Rip Currents states simply wade or swim in front of the waves. Current Red Cross and United States Lifeguard Association U.S.L.A. Rip Current policy NEEDS to be updated to ensure better and more accurate lifesaving information for the public. New signs should be posted to replace the current outdated signs and all Jr. Lifeguard programs need to discontinue disseminating inaccurate and outdated safety information concerning Rip Currents and updated to the Willis Way to survive Rip Currents. We will be happy to meet with you and a panel of qualified Ocean Safety experts at any time in an effort to help establish safer and more intelligent Ocean Safety Policy for the benefit of the current population and future generations alike. Milton B. Willis and Michael C. Willis. Hawaii in the winter months is a dream comes true for thousands of people. Many save their entire life for just 10 days experiencing the tropical romance and adventure they had always hoped existed. Throw in the big wave action, the seasonal onslaught of visitors and colorful locals, mix it up and you have one of the most intense, fun carnival/gladiators like environments on the planet. On the island of Oahu, big wave surfing is more than fun. Surfers live, breath and dedicate every thought to pursuing the dream of rising up to the challenge of surfing big waves. Consequences for big wave surfers can be brutal and sometimes fatal. The just released video biography of Titus Kinimaka highlights just how dangerous a big wave surfing wipeout can be. What follows is a true account of Kinimaka’s amazing rescue and the suffering and pain he overcame to survive. Many consider this one of the most dramatic and dangerous rescues in all of surfing history. By 7am in the morning the line up was filled with 40 or more of the best big wave surfers rising to the challenge and preparing for their time when they would have a shot at winning the prestigious event. Though the line up was filled with international talent only one surfer stood out. Ridding powerful wave after wave Titus Kinimaka dominated the line up and put on a one-man show. Kinimaka would catch the biggest wave, ride it to shore and then paddle back out just in time to get the next big wave. Kinimaka surfed aggressively on his 10’8” Willis Bros. trusted big wave gun and was having one of his best performances ever at Waimea Bay. Titus looked to be the man to beat he was catching all the best waves. Something possessed Kinimaka and drove him further to push the envelope of fate and destiny this day by taking off further back and later each time. As big as the waves were, this surfer’s confidence grew bigger and his performance escalated still higher. Titus’s surfing was on fire, but the waves were more on fire. Because of the thick west swell and the dropping tide some of the sets had begun to throw out and begin to tube. The conditions intensified, some of the waves were humanely impossible to catch much less drop down the face and make it safely to the bottom. On one such wave as if a superman Titus turned his board around and stroked hard and determined into a death defying wave launching himself and his surfboard into the air. No one thought he would have time to get to his feet let alone make the drop. After freefalling 15 feet his single fin engaged and he miraculously made it to the bottom of the wave. Before Titus could turn a canopy of water like a ton of bricks came crashing down on him driving him into his surfboard like a flattened pancake tearing off his leg shattering his femur. (Later Titus would relate how he felt something hitting him in the back of the head and flapping around he was surprised to learn it was his foot.) In the blink of an eye Titus went down in a thunderous explosion violently swallowed up by the ocean. Moments later he broke the surface of the water with a scream that came from the very depths of agonizing, excruciating pain. Big wave surfers have a code of respect and responsibility to make sure a fellow surfer comes up after a wipe out. This case would be no different for Michael Willis. Paddling back out after surfing one of the rare waves not captured, it was Willis who had the front row up close and friendly view of what had just happened. Willis didn’t wait for Kinimaka to come up; his vast big wave experience told him this was no ordinary wipeout. By the time Kinimaka came up screaming Michael Willis was right there for him. No less a heroic feat than someone who rushes into a burning building saving the occupants or pulling a helpless victim from a crumpled automobile ready to explode Michael Willis with no regard for his personal safety snatched Titus Kinimaka from the jaws of death. With 20’ plus waves continuing to pound Michael paddled over to Kinimaka and pulled him to the temporary safety of the channel. Almost immediately Kinimakas’ teeth started to chatter and his eyes began to roll upwards— he was going into shock. Michael’s experience and first aid training had taught him to keep the victim as warm and comfortable as possible. This would not be easy considering the severity of the situation and the extreme surf conditions. In no way did Titus want to risk braving the shore break to get in he was in too much pain and knew it wasn’t a chance he wanted to take. Calling over fellow surfers Robbie Page, Milton Willis, Louie Ferria and others Michael Willis formed a humane raft to float Kinimaka. Using his body as a human blanket Michael cradled Titus in his arms constantly reassuring him everything would be okay. Chest to chest heart to heart Michael Willis combined the heat from his own body and human touch to successfully control a situation that had gotten terribly out of control saving Kinimaka’s life. Kinimaka’s shivering began to subside and except for the pounding 20 waves on the outside the situation was stabilized. It would take a helicopter 45 minutes to arrive on the scene at the time this seemed like forever. Six weeks later there was a knock at Michael Willis’s door, it was Titus Kinimaka. Titus came to express gratitude for saving his life. Though he could not remember much about the rescue he did remember the comfort and warmth that helped him get through one of the worst wipeouts ever recorded. The rescue of Titus Kinimaka goes down as one of the most dramatic successful rescues in surfing history. Though Michael Willis never received formal recognition for a successful rescue in hazardous surfing conditions from the city and county of Honolulu being recognized by Titus for saving his life was enough. Today after close to two decades later Titus Kinimaka is completely healed and living on Kauai raising a beautiful family. Michael C. Willis along with Milton B. Willis continues to practice and promote Ocean Safety world wide. Surfing experts the Willis bros are recognized for surfing the world’s largest waves and teaching thousands to successfully surf. In regards to rip current policy for saving lives perhaps policy should be policies. Lifeguards policy to escape rip currents (swim sideways) has been practiced and taught to the public since 1964 exclusively. Surfers policy to escape rip currents (swim to the waves) has been exclusively practiced and taught to experienced surfers for 100’s of years. 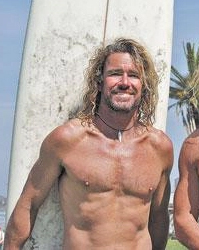 The Willis brothers and other Professional Ocean Safety Experts are advocating both methods swim side ways and or SWIM TO THE WAVES to escape rip currents be presented, practiced and promoted for Public Safety. While Lifeguards may disagree with Surfers on the rip current issue both do agree on Saving Lives through Public Education. Teach both the Lifeguard’s way and the Surfer’s way ! ! ! Swimming: The Lost Art Possibly the world’s greatest gym is the ocean and one of the best workouts is surfing. Through out time those who enter the sea to surf, swim, paddle, dive or other ocean activity come back invigorated, strengthened, renewed and filled with zeal. To raise performance and improve stamina many surfers condition themselves for surfing by swimming. While not everyone desires to surf everyone can benefit from being in condition to surf. Swimming is one of the best exercises known to man and an indispensable skill for every surfer. In the past surfers knew if they wiped out and lost their board they were in for a swim back to the beach. Today many surfers rely on protective leaches that prevent the board from washing away after a wipe out. Relying on a leash instead of good swimming skills is a mistake and could hazardous. What happens if the leash snaps or breaks? La Jolla cove is known for it’s big waves and potentially dangerous swim in if you wipe out and loose a surfboard. Almost everyone who dares to surf the cove uses a leash and this day was no different. On the outside perhaps the biggest wave of the day was looming in. All the surfers in the line up were caught by surprise when a huge powerful wave broke over them. Everyone made it through intact except one surfer whose leash snapped. Coming up for air this surfer began to panic when he did not have his surfboard with him anymore. Fortunately two San Diego lifeguards were patrolling the line up on a jet ski but unfortunately they did not notice the surfer in trouble. Not use to swimming, at first this surfer froze unsure of what to do. Looking around the surfer spotted the lifeguards in the channel but he did not spot his surfboard, which was floating only a short distance away. Rather than swim quickly to retrieve his surfboard the surfer began waving his arms and yelling for help. This went on for ten minutes or more and still the guards never saw the distressed surfer. In the mean time his surfboard was slowly drifting to shore as he continued to summon the guards in vain. After drifting half way in and safely away from the crashing breakers the guards spotted the surfer and zoomed in for the rescue. Embarrassed to be rescued or fearful of swimming the surfer asked the guards to retrieve his surfboard. The guards refused saying that was not their job and so in the end the surfer had to swim in all the way on his own power. To rub salt into the wound his surfboard ended up broken on the shoreline rocks. Had he swam for his board in the beginning he could have saved it from breaking and himself from long swim? It is assumed all surfers have a minimum ocean education and swimming skill levels. With most surfers utilizing a leash these day’s this is no longer true. Many surfers have never ever had to swim for their surfboard. Surfing schools that offer surfing programs offer a complete education when they include ocean swimming education and skill building. Perhaps participants in so California’s professional surfing PE programs in the public schools should be required to take an ocean swimming exam and test before ever being allowed to participate in surfing. One does not have to be the strongest swimmer to be a surfer or an ocean swimmer but one does need to understand the ocean and it’s flow. Knowing how to avoid or use rips, currents, tides and how to swim with the waves could save a surfers life. Whether swimming for health, piece of mind or a survival skill for surfing ocean swimming is proven to improve health and well being for humans both mentally and physically. For those not so keen on surfing or swimming just dipping ones toes in close to shore can have a completely rejuvenating effect. Surfing, swimming or just dipping all who come into the ocean leave renewed, feeling alive and clean. See you in the surf. Surfing experts the Willis Bro’s. 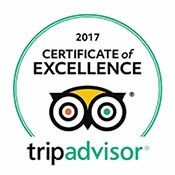 are recognized for surfing the world’s largest waves and teaching thousands to successfully surf. Come, Live the Life! Teaching Children to Surf !! !